The Local Award Ceremony at the Hovelsrud villa on the Helgøya island in Norway, a winner of a 2014 EU Prize for Cultural Heritage / Europa Nostra Awards in the Conservation category, was held on the afternoon of 16 August. The programme focused on admiring the meticulous restoration work, both in the home and garden, which the Jury recognised as being truly outstanding. The Award was presented to the owners of the property by Erik Schultz, Chairman of Europa Nostra Norway, in front of an audience of some 70 people. 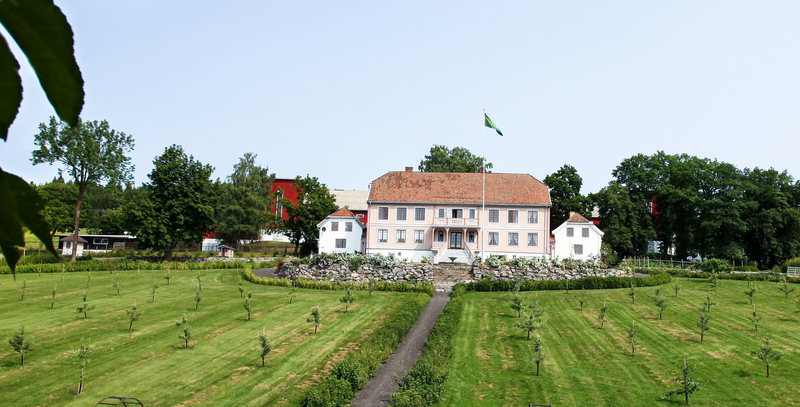 “Hovelsrud is a classic example of how involvement, perseverance and proper management by the owners has allowed the garden and main building of Hovelsrud Gaard to be brought back to its old glory of the 1840s. Values such as these are well entrenched in the work of Europa Nostra and its member organisations,” stated Erik Schultz. “Two weeks prior to this ceremony, I received a phone call from Professor Peter Emil Kalland at the University of Bergen, who received an EU Prize for Cultural Heritage / Europa Nostra Award in 2004 for the conservation of the Heathland Centre in Lygra, north of Bergen. He stressed that once they received the Award the Heathland Centre was lifted from anonymity to national and international recognition. It raised awareness locally and engaged public bodies. Hovelsrud Gaard is on its way to a similar experience,” affirmed Erik Schultz. The ceremony featured a presentation about ‘Decorative Painting’, given by Jon Brænne, Painting Conservator at the Norwegian Institute for Cultural Heritage Research, as well as a lecture about ‘Home and Garden in Landscape Context’, delivered by Prof. Anne Katrine Geelmuyden from the Norwegian University of Life Sciences. They were followed by the assessment of the restoration of the Hovelsrud villa by the Landscape Architect Mette Eggen. After the unveiling of the commemorative place, the 70 guests visited the skillfully restored house and garden.